Poor credit practices, not energy sector SOEs are the cause of high NPLs In a number of publications, I have read both practitioners and consultants in Ghanamaking the statement that debts owed to banks by State Owned Enterprises (SOE) especially in the energy sector has been a primary cause of defaults in 2016. 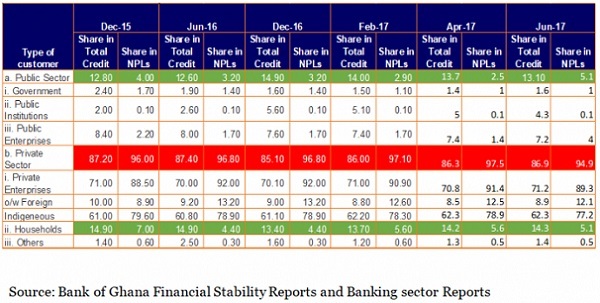 On two separate occasions, I have pointed out to my brother and friend BernardAvle of CitiFM using the table below extracted from the Bank of Ghana stability reports that public sector debt including debts owed by the Energy sector SOE is not the issue when it comes to non-performing loans (NPL).My comments has always been about credit risk practices of the banks. For argument sake, let’s add the Bulk Oil DistributionCompanies’ (BDCs) exposure which is sitting in the private sector section of the table as part of SOEs. My answer will still be the same, energy related SOE and BDCs are all not the problem or cause of default and they are not cause of high non-performing loan (NPL) ratios among the Banks and the industry. When it comes to SOEs and BDC, in my view the primary cause of default is simplynumber three above which is the irresponsible credit decision taken by some in the Ghanaian Banking Industry. Some may argue otherwise and say it is more of economic conditions such as oil prices, government action to subside oil prices, and the inability of Tema Oil Refinery (TOR)to raise sufficient working capital / letters of credit (LC )facilities to import oil, which in certain periods lead to almost ceased operating activities of TOR and others. In a regression analysis, you may have several independent variables, but there are some which may have high explanatory power (coefficient or beta) than others. My view without performing actual regression is to say that item 3 will have high explanatory power than others. You can argue this in another way. As stated above credit risk can either be willingness or the ability. The presence of implicit guarantee or collateral itself can be incentive (willingness) for the borrower to default and an incentive for the lender to make faulty credit decision which leads to default. Example, if the value of collateral declines because house prices decline, borrowers in some jurisdictions have a greater incentive to default on their mortgages. IFRS 9.B5.5.17 (j) and (k) support this argument as well. So how do I prove that the primary cause of default for energy related SOE and BDCs debts is due to the banks irresponsible credit decision? There are two ways this can be prove. A regression analysis of the energy-related SOE default (dependent variable) and the relevant 5 factors above which have supportive literature and empirical basis (independent variables). This is achieved through a detailed analysis of historical patterns and current trends to identify factors that affect repayment/ collectability of energy-related SOE loans, whether related to borrower incentives, willingness or ability to perform on the contractual obligations, or lending exposure terms and conditions. Expert credit judgement which is reasonable and supportable. Absence of data, I cannot perform test 1, so I go with test 2.
the purpose of the credit and sources of repayment; the current risk profile (including the nature and aggregate amounts of risks) of the borrower or counterparty and collateral and its sensitivity to economic and market developments; the borrower’s repayment history and current capacity to repay, based on historical financial trends and future cash flow projections, under various scenarios; for commercial credits, the borrower’s business expertise and the status of the borrower’s economic sector and its position within that sector; the proposed terms and conditions of the credit, including covenants designed to limit changes in the future risk profile of the borrower; and Where applicable, the adequacy and enforceability of collateral or guarantees, including under various scenarios. In addition, in approving borrowers or counterparties for the first time, consideration should be given to the integrity and reputation of the borrower or counterparty as well as their legal capacity to assume the liability. Some of these SOE were visibly bankrupt but Banks kept lending to them, why? Because Father Christmas Government of Ghana (GoG) will pay if those SOEs default. Why will the Banks think that way? It is because GoG in the past has done that. First Candy from Father Christmas was to Ghana Commercial Bank (GCB) in relation to TOR debt. As at the end of December 2008, the overdraft position of TOR with GCB was approximately GH¢598 million, mainly in the form of established LCs, which crystallizes into overdraft facilities. The debt later grew to GH¢848 million because of the interest that had accrued on it and with the payment. Second Candy from Father Christmas was to syndicated Banks. 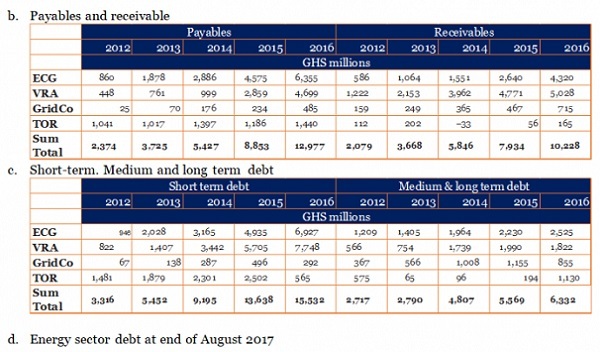 Aside from the GCB debt, TOR as at the end of September 2010, had outstanding syndicated loan balance of GHC16.3 million. There is no formal government guarantee as the government verbally advised in June 2010 that it cannot give a guarantee as it would be contrary to agreements with the International Monetary Fund (IMF). The government led an initiative to restructure the TOR balance sheet. So how was Candy 1 and 2 paid? Father Christmas appointed Ecobank Development Corporation and Ecobank Ghana Limited as Transaction Advisors to ascertain the true state of TOR’s debt and to raise 300 million dollars to settle part of TOR’s debt and issue bonds to raise another 300 million dollars to restructure TOR’s balance sheet, especially its working capital. Government in the 2011 budget included an upward adjustment of the Debt Recovery Levy to retire the TOR debt and reduce its negative effect on the banking system. Now we have the third Candy. Let’s celebrate again, Bankers. The industry’s exposure to these energy –related SOEs was estimated to be GHS3.2 billion in 2016 and the industry’s exposure to BDCs was in excess of US$500 million, emanating from foreign exchange losses and under recovery from subsidies on petroleum products. In December 2015, the Energy Sector Levies Act (ESLA) was passed to address debt situation through the imposition ofconsumption tax levies on petroleum products. Government of Ghana acting through the Ministry of Finance is sponsoring a special purpose entities to issue bonds to pay off the outstanding energy related bonds backed by the collections under the ELSA. The SPE is planning to issue Energy Bond of GHS 10 billion to finish paying the outstanding debt of the energy related SOEs and BDCs. E.S.L.A. Plc, was incorporated as a special purpose vehicle in Ghana as apublic limited liability company on September 14, 2017 withregistration number “PL000312017” to, among others, issue debtsecurities for the purpose of refinancing the Energy Sector Debt. The Bondholders will be repaid primarily with the ESLA Receivables. The accounting principles IMF adopts are outside Ghana’s control. In the event that IMF classifies the non-performing state owned entities debt obligations as part of stock ofgovernment’s debt, then the government’s debt to GDP and other debt metrics may deteriorate. UT and Capital Bank recently received the fourth candy from FatherChristmas. UT is reported by some to have exposure outstanding with the BDC and SOE. The regulator revoke the licenses of UT and Capital on basis that each Bank’s liabilities exceed its asset (insolvent). The regulator went ahead to say all depositors will get their money. If liabilities are more than assets and significant share of liabilities are depositors, where are you getting money to pay the shortfall of the assets to pay depositors. These four candies in my view is basically a bail out of the Banks. Father Christmas government imposed levies on innocent Ghanaian to rescue crap credit decision by some banks. So what is my recommendation to avert these poor credit decisions from Banks when it comes to energy related SOEs and BDCs? Pass a law to explicitly say that there is no implicit guarantee of debts of SOE especially the energy related ones and that Banks at their own. This has been done before in other countries. Example, in 2001, government guarantees for savings banks in Germany were removed following a law suit. What happened to that? I was found out that that the removal of government guarantees resulted in a significant reduction in banks’ exposure to credit risk. Exposure to credit risk decreased significantly more in banks, for which the value of guarantees was higher ex ante. Savings banks shifted their portfolios towards safer borrowers by dropping existing borrowers with higher credit risk and by tightening their lending standards for new borrowers. Loan sizes were reduced. Section 56 of Act 930- The Bank of Ghana may prescribe rules regarding any matter of corporate governance of a bank, including matters relating to (a) the scope and nature of the duties of directors of a bank, (b) the requirements for audit and other specific committees of the Board; (c) the responsibilities of key management personnel; (d) risk management; (e) internal audit; and (f) internal controls and compliance. Section 30 of Act 930 states that the Bank of Ghana may require a bank, specialised deposit­ taking institution or financial holding company to maintain additional capital that the Bank of Ghana considers appropriate to address concentration of risks in the bank, specialised deposit-taking institution or financial holding company, or in the financial system. Section 78 of Act 930 requires Banks to prepare accounts and financial statements in the form and provide details in accordance with a) internationally-accepted accounting standards; and b) rules or standards based on the Basel Core Principles as prescribed by the Bank of Ghana. In view of the requirements of section 78 of Act 930, BoG should require all Banks to follow the follow the following Basel principles Basel Committee on Banking Supervision (BCBS) publication 75 called “Principles for the Management of Credit Risk” . Banks with NPLs above a set threshold (for example, 10 percent) should be subject to a more intensive oversight regime to ensure that they conservatively recognize and proactively address asset quality problems. Conservative application of accounting standards should be supplemented by micro- and macro prudential measures, such as time-bound targets for resolving delinquent assets and raising risk weights on impaired assets of a certain vintage (above the current 150 percent, under the “standardized approach” adopted by all Banks in Ghana). So how will all these irresponsible credit decisions that continues to be made by some banks in Ghana for energy –related SOE play out in IFRS 9 world. As you aware of IFRS 9 impairment is a three stage model which requires the when a Bank originate a loan, the loan will start in stage 1 and the Bank will book a 12-months expected credit loss.The Bank will need to monitor that loan and if at some point if there is a significant increase in credit risk, the loan will move to stage 2 or 3 and the Bank will increase the amount of provision to a life time credit loss. Significant increase in credit risk is not an absolute test it is a relative test, meaning it is not the case that all loans below a certain credit grade will be in stage 2 rather Bank will need to monitor the credit risk of a loans and see if the credit risk has significantly increase since the loans was first recognized. Relative assessments of significant increase in credit risk is not consistent with most credit risk management practice. Significant increase in credit risk depends on risk of default and not the risk of loss , meaning if you have a loan that is fully collateralized , it can still move from stage 1 to stage 2 if the borrower becomes significantly less likely to repay the loan, even though the borrower defaults the Bank may not expect no loss because the loan is fully collateralized. Significant increase in credit risk happens before default or past due take place. I say hallelujah and amen to point 2 above. In other words, the assessment of significant increases in credit risk since initial recognition is made in terms of the risk of a default occurring and not expected credit loss (i.e. before the consideration of the effects of credit risk mitigants such as collateral or guarantees). So what does this means to the energy-related SOE debts under IFRS 9 world? It means you can make the implicit guarantee assumption at origination in your pricing of credit risk and also in your staging. The staging requirements in IFRS 9 includes this guidance as well. Attributes of Financial Instruments such as Covenants, Collateral, and so on. External Market indicators of credit risk such as Credit Spread,Credit Default Swaps, extent to which a financial asset has been below amortized cost, price of borrower’s debt and equity instrument and so on. *Actual or Forecast of Financial Conditions that will affect the borrower’s ability to pay its debt obligation. *Actual or Forecast of Economic Conditions that will affect the borrower’s ability to pay its debt obligation. *Actual or Forecast of Business Conditions that will affect the borrower’s ability to pay its debt obligation. *Actual or Forecast Operating results of the borrower such as revenue, margins, operating risk, asset quality, leverage, operating risk, quality of management, liquidity, scope of business and so on that will affect the borrower’s ability to pay its debt obligation. *Increased Credit Risk on other financial instruments of the borrower Adverse change in the Regulatory, Technology environment of the borrower that will affect the borrower’s ability to pay its debt obligation. *Here are some of the credit related impacts of IFRS 9. *What are the delinquency levels in the portfolio? *Which products are performing well, and which are performing poorly? *Which location/ geographies are performing well, and which are performing poorly? *Which business units are performing well, and which are performing poorly? *Which vintages are performing well, and which are performing poorly? *How much of the portfolio is rolling from one delinquency bucket to the next? *What are credit scores throughout the portfolio? *Which starting credit rating are rolling into default and at what point do they roll into default? *How many new loans are being originated, and with what characteristics? *Are write-offs rising or falling, and is one product type or geography experiencing more write-offs than another? *Are receivables, delinquencies and write -offs in-line with forecasts for these metrics? *How is the portfolio performing on such metrics as probability of default, loss given default and exposure at default? The impact of IFRS 9 goes beyond accounting. A bank that does a thorough implementation of IFRS 9 will need to generate new data and new models for measuring credit risk. And the old adage ‘what gets measured gets managed’ kicks in. This new information, if used to manage credit risk, is likely to influence how a bank behaves. The bank may take credit risk management actions earlier or may adjust the pricing or other terms of some loans or may even cease to sell some products. IFRS 9 was introduced to help investors understand the risks a bank faces. It’s high time for investors and Bank management to pay attention to IFRS 9 implementation and its impact on the business model and how to effectively manage capital. While it is equally important to give attention to raising capital to meet the new minimum regulatory requirement, analysts and shareholders reviewing the performance of banks should give consideration to other factors beyond the fact that a bank has met the new capital requirement. These factors and the analysis that is important are explained in the paragraphs that follow. Today we look at delinquent customers and ask, which ones do I want to keep? That question is going to change in two major ways under IFRS 9. First, if a customer is in Status 2 or 3, curing them doesn’t change their status. They still represent a higher risk, and you’re still going to be paying lifetime impairments on them. So you have to ask, what is the cost of keeping them on the books? Unless you can make a case for why their actual risk status has changed (rebuttable), they’re still going to be expensive. Banks are going to need to get forensic with treatment analytics and decisions. Who you keep and why is now far more complicated. That brings me to the second big change here: You may find yourself in the position of saying goodbye to customers you just cured. That makes it tricky for collectors – what can you tell customers about their near-term relationship with the Bank once they cure? It will be a communications headache for customer relations. At some point, regulators will probably have something to say about this too. And then, if you are going to be exiting “good” customers, who will you sell them to? When? And at what cost? Will debt purchasers understand how to price these accounts? Will your current debt collection agencies have the capacity to handle more accounts from you? Will they want to work the low-performing debt or performing debt? In a Deloitte survey, most price makers expect that moving to an IFRS 9 expected credit loss (ECL) model will have an impact on product pricing, while most price takers still think that this is unlikely to have credit pricing decision on a risk adjusted price. If all Banks start factoring the expected losses likely to be maintained on account of on boarding a particular account in the pricing of the products, pricing is expected to increase manifold (at least for the moderate and high-risk customers). This kind of scenario may not prove economical for these customers to go for a banking facility. Customers are about to come across lot of surprises in terms of pricing. As a cyclical effect, higher levels of pricing may lead to more defaults. Also, there might be a need for institutions to revise the pricing for the existing portfolio of funding. It may happen that customers who have opted for adjustable rates on loans are quite likely to feel the pinch. Collection and recovery practice. Until now, it’s been OK for a certain amount of accounts to roll from current (stage 1) to special mention (Stage 2). This kept Banks within their cost to collect, Banks met their regulatory requirements, Banks only have so much capacity to work accounts, and Banks know that some accounts will self-cure in special mention. Why is the CFO going to be looking for you? Simply because just about every authority on IFRS 9 is saying impairments will rise by not less than 30%. Some are saying 50%. That is going to have a significant impact on profitability at the account, segment and portfolio levels. It’s going to make your CFO take a keen interest in how collections can impact the volume of accounts rolling to Stage 2. Banks will carry a heavy cost of letting those accounts that cure after 31 days past due get that far. So you will have to do more in the first 30 days than ever before. At the same time you will have to watch the cost to collect, Net Promoter Score (NPS) and regulatory compliance. As noted earlier delinquency shouldn’t be your primary trigger for escalating impairments if you want to meet the spirit of the standard. If by any measure your Bank can tell that a customer’s creditworthiness has eroded, you will probably need to escalate that customer to Stage 2. If a Bank is planning to use its existing watch-list process to capture and monitor the qualitative factors that influence significant increase in credit risk, the key step that the Bank needs to perform is to perform a gap analysis i.e. compare the existing watch list systems and process that it has versus what IFRS 9 requires. For example are all of the 16 qualitative factors or the relevant ones already captured in the watch-list process and if they are, what is the governance around that to ensure that they are being interpreted consistently to judge whether individually or in aggregate those qualitative factors indicate significant increase in credit. Also, the watch list process has to be linked with ratings, relative measure, and processes as well as ensuring that it is symmetrical. The first step in IFRS ECL approach is to analyze the Loan Portfolio, identify factors that affect collectability of loans (credit risk) and identify Relevant Credit Quality Indicators. Though Credit risk is already a primary focus for your institution, but you should also be aware of the hidden concentration exposure within your loan portfolio. A thorough and segmented analysis is a critical first step to creating the necessary insights into your loan portfolio. It will also identify any gaps in your assessment of credit risk. Break your loan portfolio into specific pools or individual transactions. The segmentation will give you a deeper understanding of similar/like credit characteristics, positioning your institution to make wise decisions on new loans, emerging concentrations, credit pricing and roll-out of new lending products. Once you have a sense of your risk factors, it’s important to ensure you have clarity about the credit quality indicators (CQIs) impacting your loan portfolio. This insight positions your institution to be able to assess eminent future portfolio losses and make informed pricing and credit decisions. It takes diligence but staying aware of relevant qualitative environmental and macroeconomic factors will keep your bank prepared to respond to any forecasting changes in credit quality. Regression and vintage analysis both are great resources to determine which CQIs correlate most directly to actual losses within your loan segmentation. Once you have a firm grasp on the risk and quality indicators in your loan portfolio, you are ready to begin reviewing ECL models to determine which is most appropriate to forecast future losses. My final advice is to use this as opportunity to understand your portfolio and its risk, using the data derive to understand the reasons for default and loss. Think of IFRS 9 ECL requirements as not compliance but an assessment of Risk. An important factor to consider is that the more detailed approach provides an opportunity to improve business processes far beyond ECL compliance. If you’re spending money on a solution that can estimate the risk associated for any loan, why use that information only for compliance? Loan-level risk data is valuable information. With it, loan officers can better decide whether to extend a loan and at what terms. Relationship bankers can suggest appropriate products to customers based on their risk profiles. Chief Risk Officers can see comprehensive reports on allocated and available reserve funds, helping CFOs calibrate lending policies and CEOs establish profitability goals.